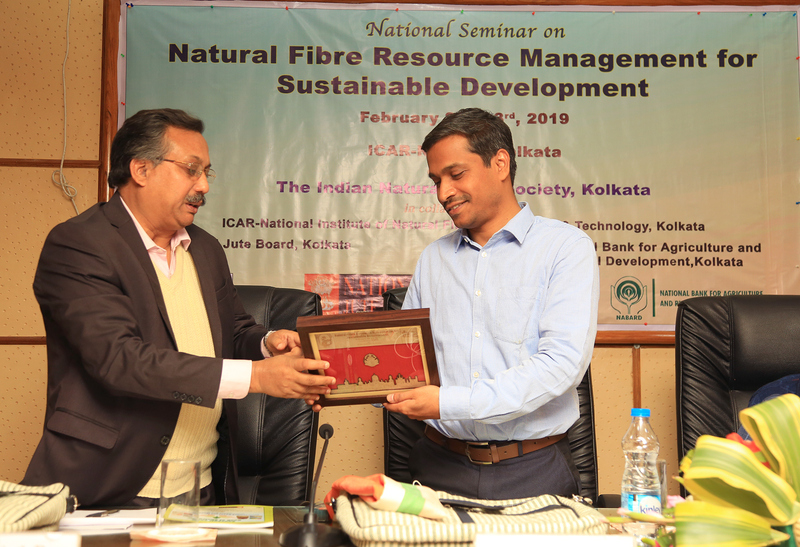 The Indian Natural Fibre Society (TINFS), Kolkata organized a two-day National Seminar on “Natural Fibre Resource Management for Sustainable Development” in collaboration with ICAR- National Institute of Natural Fibre Engineering and Technology (NINFET), National Jute Board, Ministry of Textile and National Bank for Agriculture and Rural Development (NABARD) during February 2-3, 2019 at ICAR-NINFET, Kolkata. The inauguration of the program was started by welcome song followed by Lightening of Lamp. Dr. Alok Nath Roy, President, TINFS honoured Dr. K.K. Satapathy, Guest of Honor of the Programme and Shri Arvind Kumar M, Chief Guest. Dr. Alok Nath Roy, President, in his welcome address deliberated about achievements by the Society during past years. He told the contribution of TINFS for sustainable development of livelihood of farmer growing Natural Fibre. He mentioned the journey of JTRL to NINFET and the impact of it on the society. He stressed upon the that ICAR- NINFET should come out with a larger research domain including silk, ramie and special emphasis on flax fibre. He also conveyed his expectations for collaborative movement with NJB, NABARD towards Natural Fibre Resource Management. Shri Arvind Kumar M, Chief Guest of the programme, congratulated TINFS and NINFET for organizing the national seminar which is the best platform for exchanging the research ideas for sustainable development of natural fibre sector. He also talked about the strategies that can be adopted for Natural Fibre Management for sustainable development. He was very optimistic for employment generation through use of natural fibres and contribution of ICAR- NINFET in this area. Dr. K.K. Satapathy, focused on strong promotion of materials made from natural fibres and stressed upon the use of products in our daily life from it. He mentioned the adverse effect of use of synthetic fibres on human life and environment in present day scenario. He expressed his happiness for transformation of JTRL to NIRJAFT and now NINFET, which deals with research and development programme in the field of natural fibre. The two-day seminar will be attended by the scientists and researchers on natural fibre from different parts of the country. Vote of thanks on inaugural sessionwas delivered by Dr. G. Bose, Organizing Secretary of the Seminar.